Joseph V. Stalin: Experience has taught me to face up to reality, no matter how unpleasant it may be, and to tell the truth. It is good to see this 1994 television miniseries finally come out on DVD. Be prepared for a long evening (the running time for the two discs is three hours 23 minutes) but it is time well invested. WORLD WAR II: WHEN LIONS ROARED is a creative montage of actual film clips from the newsreels shown in theaters at that time together with contemporary filmed drama in script written by David W. Rintels and crafted and directed by Joseph Sargent. This film allows us to revisit history the way it was - with more behind the scenes activity among the great powers than most other films offer. 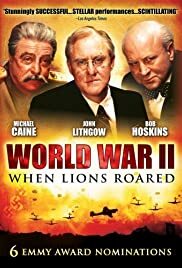 The roaring lions are very well portrayed by John Lithgow as Franklin Delano Roosevelt, Bob Hoskins as Winston Churchill and Michael Caine as Stalin. Each actor steps wholly into his role without resorting to mimicry or simply stage makeup. It is fascinating to see how the USA was a non-intervener at first (a refreshingly different stance form the current aggressor role we have adopted) and how the needs of the planet required global cooperation in the face of Hitler et al. Ed Begley Jr. offers a lot of information about the important figure Harry Hopkins about whom we hear little as does Jan Triska as Vyacheslav Molotav, Stalin's key man.